The modern tradition of wearing costumes on Halloween can be traced back more than 2000 years to the Celts of ancient Britain. 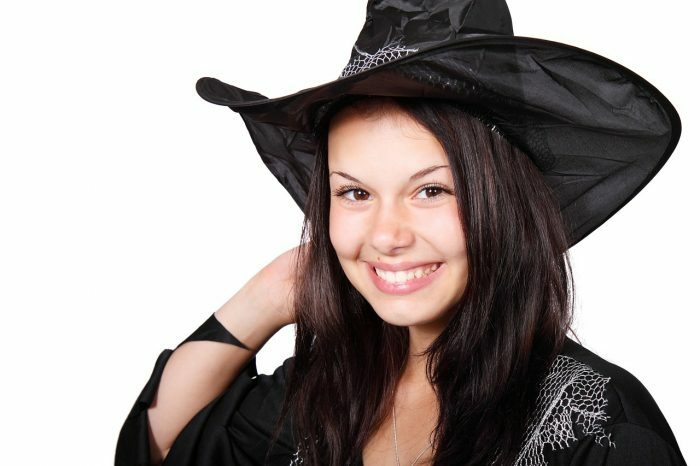 During a Druidic festival known as Samhain, which is still celebrated by Wiccans and other modern pagans, revelers would often wear masks or costumes. In modern times wearing costumes is considered to be “innocent fun”, but in those times the masks and costumes were worn for very specific spiritual purposes. For some, the goal was to ward off evil spirits, but for others the purpose of the mask or costume was to help the participant communicate with the spirit world. And as you will see below, there are some that still believe in this practice today. So it is definitely not a coincidence that people have always dressed up as ghosts on this day. In addition to divination, some wore masks and costumes because they believed that it would give them spiritual power. Halloween masks and costumes were used to hide one’s attendance at pagan festivals or—as in traditional shamanism (mediated by a witch doctor or pagan priest) and other forms of animism—to change the personality of the wearer to allow for communication with the spirit world. Here, costumes could be worn to ward off evil spirits. On the other hand, the costume wearer might use a mask to try to attract and absorb the power of the animal represented by the mask and costume worn. According to this scenario, Halloween costumes may have originated with the Celtic Druid ceremonial participants, who wore animal heads and skins to acquire the strength of a particular animal. Even today, millions of people look forward to “being someone else” for a few hours on Halloween night. On Samhain night the Faerie folk are believed to be very active and delight in playing tricks on humans. If you’re near a faerie mound, be very careful not to be drawn inside, else you may disappear for a few hundred years. The Fey enjoy gifts of food and drink and pretty baubles, so be sure to leave treats for the Faeries so you won’t be tricked! In order to fool the Nature Spirits, our pagan ancestors would dress up in costumes if they had to travel about on Samhain night. They would dress all in white, like ghosts, make disguises of straw, or dress as the opposite gender. I suppose that the Faeries were so busy laughing at the costumes they forgot to play any tricks! Another school of thought regarding dressing up at Samhain has a much more spiritual basis. Dressing as a ghost or skeleton could be seen as a form of “sympathetic magick” allowing us to experience what it could be like to be on the other side of the veil. Halloween has a very deep spiritual dimension, but most people never think too much about where all of these traditions originated. We should never be afraid to ask hard questions, and this is a point that I make very strongly in my latest book entitled “Living A Life That Really Matters”. I never understood the shocking history behind any of our holidays while I was growing up, but I wish that somebody would have told me the truth. One survey discovered that there are more than 300,000 Wiccans and pagans in America today, and for them it is still a night when the veil between the living and the dead is the thinnest that it will be all year. Samhain is a night for divination, the veil between the world of the living and the dead is at it’s thinnest making this the best night of the year to find out what the future has in store. Pull out your crystal ball, scrying mirror, Tarot, runes, stones or bones, don’t miss this opportunity to see into the future. When you participate in the exact same things that they are doing, don’t be surprised if you end up opening the same spiritual doors that they are opening. There is a reason why Halloween feels so different than every other day of the year. Even if you try to ignore spiritual reality, it is always there, and it is more powerful than most people would dare to imagine.